iTapuih.com - Soal Bahasa Inggris Persiapan UN SMA 2016 (Part 1). Ujian Nasional biasa disingkat UN / UNAS adalah sistem evaluasi standar pendidikan dasar dan menengah secara nasional dan persamaan mutu tingkat pendidikan antar daerah yang dilakukan oleh Pusat Penilaian Pendidikan. Sebagai usaha persiapan menjelang Ujian Nasional, saya telah menyedikan beberapa soal untuk adek-adek yang sedang melaksanakan UN. Soal Bahasa Inggris Persiapan UN SMA 2016 (Part 2) dan Soal Bahasa Inggris Persiapan UN SMA 2016 (Part 3) bisa anda klik pada tombol paling bawah. Semoga soal-soal di bawah ini dapat membantu dalam belajarnya. Once upon a time, there lived as neighbours, a bear and a rabbit. The rabbit is a good shot. In contrary, the bear is always clumsy and could not use the arrow to good advantage. One day, the bear called over the rabbit and asked the rabbit to take his bow and arrows and came with bear to the other side of the hill. The rabbit was feared to arouse the bear's anger so he could not refuse it. He consented and went with the bear and shot enough buffalo to satisfy the hungry family. Indeed he shot and killed so many that there was lots of meat left after the bear and his family had loaded themselves and packed all they could carry home. The bear was very gluttonous and did not want the rabbit to get any of the meat. The rabbit could not even taste the blood from the butchering as the bear would throw earth on the blood and dry it up. The poor rabbit would have to go home hungry after his hard day's work. The bear was the father of five children. The youngest child was very kind to the rabbit. He was very hearty eater. The mother bear always gave him an extra large piece of meat but the youngest child did not eat it. He would take it outside with him and pretended to play ball with the meat. He kicked toward the rabbit's house and when he got close to the door he would give the meat with such a great kick. The meat would fly into the rabbit's house. In this way, the poor rabbit would get his meal unknown to the papa bear. 1. What do you think about the bear? 2. Who gave the meat to the rabbit? Health food is a general term applied to all kinds of foods that are considered more healthful than the types of foods widely sold in supermarkets. For example, whole grains, dried beans, and corn oil are health foods. A narrower classification of health food is natural food. This term is used to distinguish between types of the same food. Fresh fruit is a natural food, but canned fruit, with sugars and other additives, is not. The most precise term of all and the narrowest classification within health foods is organic food, used to describe food that has been grown on a particular kind of farm. Fruits and vegetables that are grown in gardens treated only with organic fertilizers are organic foods. They are neither sprayed with poisonous insecticides nor refined after harvest. In choosing the type of food you eat, you have basically two choices: inorganic processed foods, or organic unprocessed foods. A wise decision should include consideration of allegations that processed foods containing chemicals are proven to be toxic. It also states that the vitamin content is greatly reduced in processed foods. 5. The topic of the text is ... .
6. Which statement is TRUE according to the text? 7. What is the main idea of the second paragraph? 9. “They are neither sprayed with poisonous insecticides nor refined after harvest”. Blood pressure measurement has two components: systolic and diastolic. Systolic pressure is taken when the heart is contracting to pump blood; diastolic pressure is taken when the heart is resting between beats. In the usual blood pressure reading, the systolic measurement is given first and is the higher of the two. Normal blood pressure is a systolic measurement of 120—140, and when the systolic pressure is 160 or higher, then hypertension exists. Systolic pressure between 140 and 160 indicates borderline hypertension. 10. Which of the following is true about diastolic blood pressure? A. It is taken during the contraction of the heart. B. It is usually given first in a blood pressure reading. C. A normal systolic measurement is 120 – 140. D. Hypertension exists when the systolic pressure is below 140. E. It is one of the two components of blood pressure measurement. 11. Which of the following best states the topic of the text? I am writing to complain about ads on TV. There are so many ads, especially during my favorite programs. I think they should be stopped for a number of reasons. First, ads are nuisance. They go on for a long time and there are so many. Sometime the duration for ads is longer than the program itself. Second, ads give a bad influence on people. They try to encourage people to buy unhealthy food like beers, soft drinks, candies, etc. In other words, they make people want things they do not really need and cannot afford. Finally, it seems that ads play an important role in the programs people watch. There are lots of ads in the programs, watched by a lot of people. Meanwhile, some programs which are not so popular are stopped because they do not attract enough ads, even though those programs may be people's Favorite. For those reasons, I think TV stations should stop showing ads. They interrupt programs, and have bad influence on people and they sometimes put a stop at people's favorite shows. I am sick of ads and now I watch movie in the cinema. 13. What is the topic of the text? 14. What is the writer's suggestion to the editor? 15. Which of the following is NOT mentioned in the text? 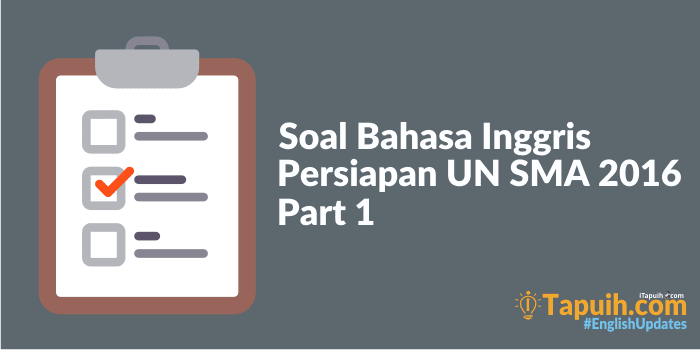 Demikianlah artikel tentang "Soal Bahasa Inggris Persiapan UN SMA 2016 (Part 1)". Klik tombol Lihat Kunci Jawaban untuk melihat kunci jawabannya. Jika masih bersemangat silahkan lanjut Test berikutnya. Saya sudah menyediakan soal berikutnya dengan mengklik tombol dibawah ini.